Mall food just got better. 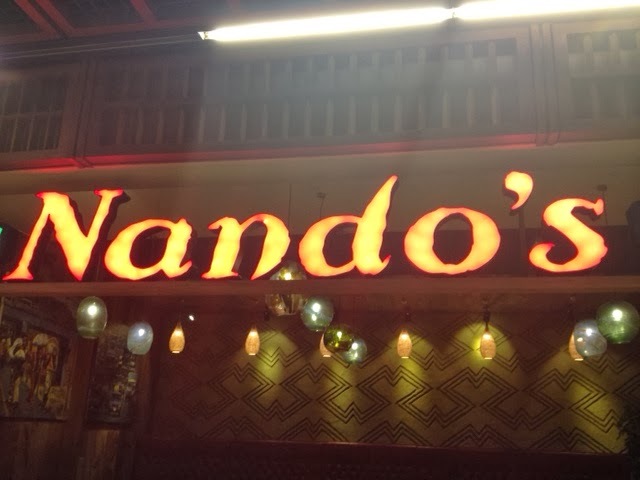 Nando's has come to Abu Dhabi. The legendary flame grilled chicken outlet has finally opened its doors in Abu Dhabi, and it has done so in spectacular fashion. I believe their restaurant in World Trade Centre mall in Abu Dhabi is one of the largest in the world and seats about 350 people! But don't be daunted by that. The lay-out means you never feel you are seated in a stadium about to feast on some chicken! This is because despite the huge floor space, there are clear different sections. Soon to be immensely popular in Abu Dhabi. 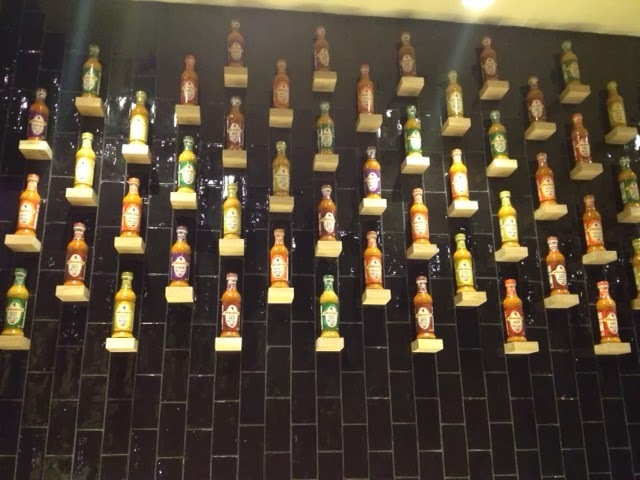 The wall of flame - the tantalising hot sauces displayed. 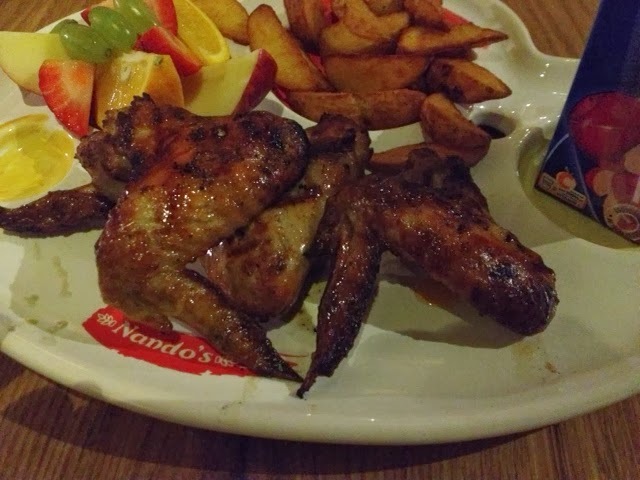 For those who have been in a coma the last few years and do not know Nandos', the company started out in South Africa in 1987 and has since grown tremendously. 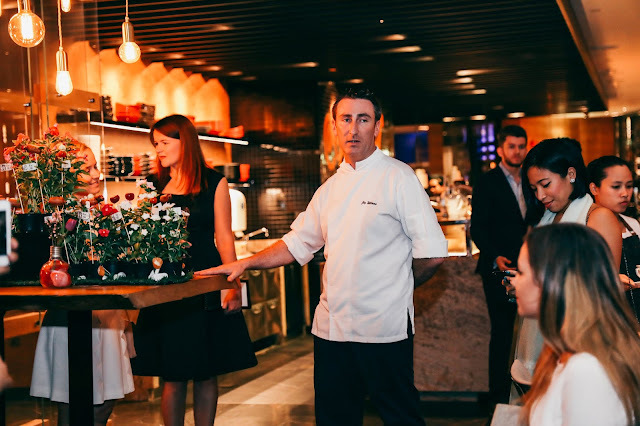 It has restaurants all over the world, and thanks to its just as-legendary advertising campaigns, it has been regarded as one of the top 30 Brands in marketing by Ad Age International. In their markets, they are well known for their tongue-in-cheek adverts which play on words and satirise current affairs. The first thing that will strike you is the space despite the number of seats. The next thing will be the beautiful art work that was commissioned from local artists in South Africa. Furthermore, the look of raw wood furnishings makes it a very different place to visit. 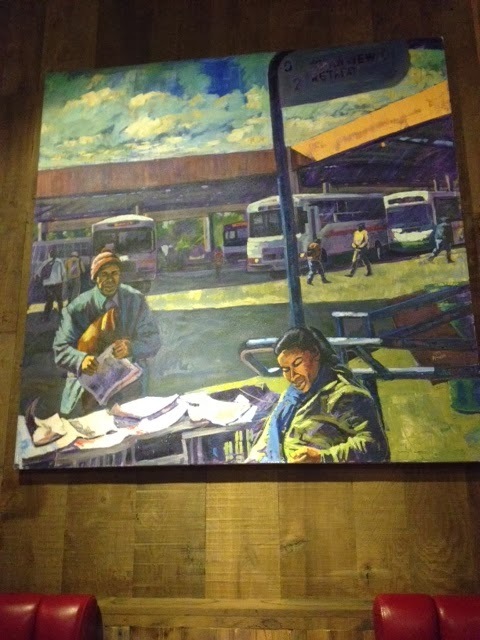 One of the many paintings on display, creating a unique dining space. 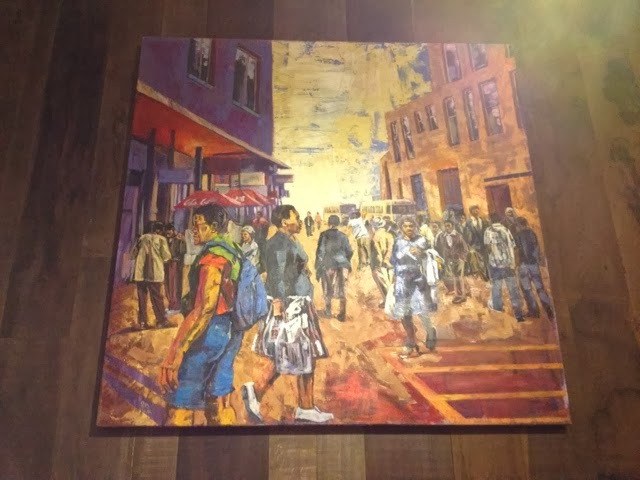 Art captures every-day life in South Africa. But what about the menu? I hear you muttering. We ordered the classic wings, chicken livers in peri peri sauce, and a chicken and spicy rice combo. Finally, my daughter got one of the kids' meals: chicken wings, wedges, fresh fruit and juice. Bad casual kids' meals have just been put on notice! The chicken was outstanding. It is such a change from overcooked, dried out chicken that one gets at these casual dining places. To taste that crispy skin is one thing, but to be greeted by that juicy inside is even better. You simply have to get in there with your fingers; no other way to eat it, and if you should lick your fingers, why not? It is so good that you want to savour every last bit of the taste. Any false notes? The spicy rice was just like coloured rice. Felt a bit flat for me. Of course they do not proclaim it to be hot spicy, but still one expects a bit more. Highlights? The kids meal. Fresh fruit as part of the meal? Nice indeed. The art work, definitely. The chicken livers. Big yes. Taking something as off the beaten plate, so to speak, as liver and making it a marvellous appetiser - is brilliant. The chicken. Of course the chicken. Not commenting on the chicken is like going to Cape Town and not mentioning Table Mountain. 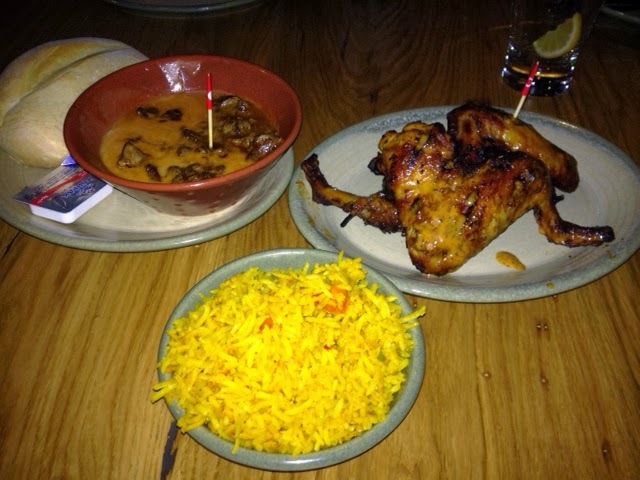 The chicken was mouthwatering. Crispy and succulent but without a hint of it being undercooked. 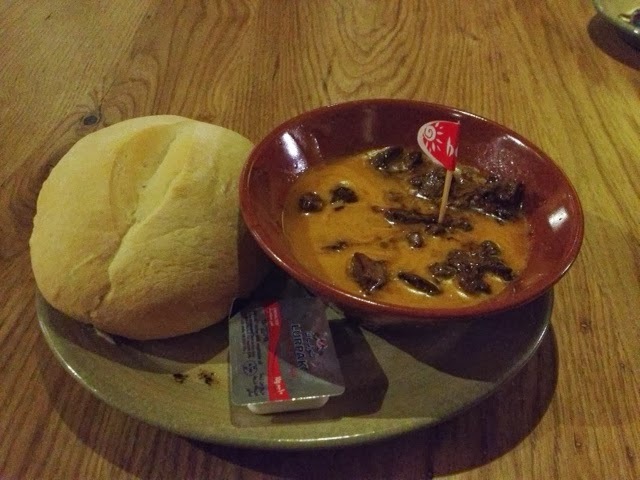 Chicken livers in the super hot peri peri sauce. Disappointing spicy rice in the foreground. If I were management at Applebees, TGI Fridays or Chili's, I would be seriously intimidated. 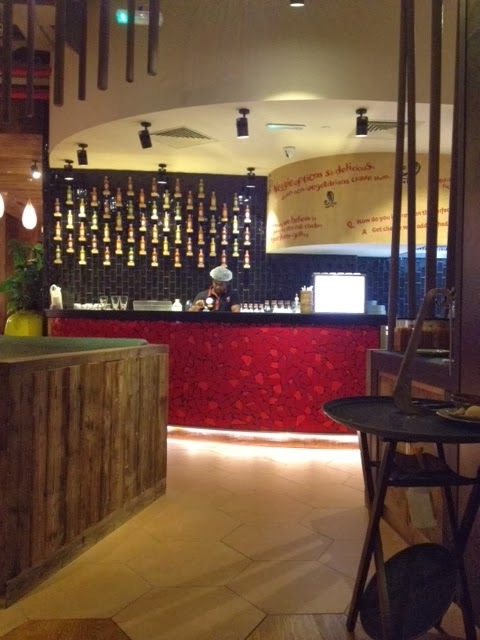 Nando's with its simple menu where chicken takes centre stage, together with a very pleasant environment and super animated service will make a dent in the upmarket casual dining market. It offers what these other restaurants do not - a casual food and cultural experience that is rich and different. People are tired of casual American dining places. 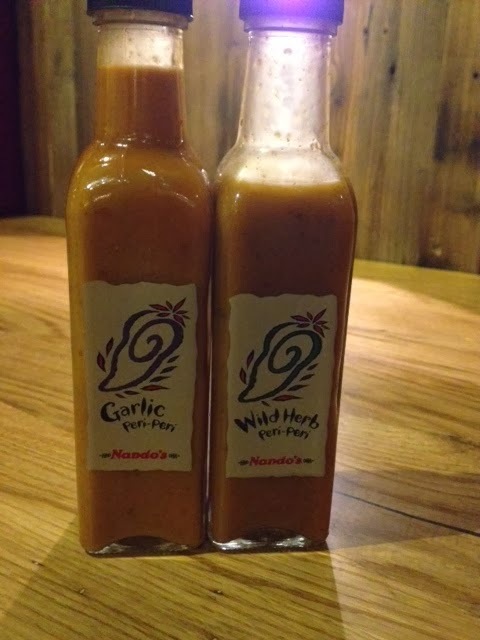 They are crying out for something new but good - that is Nando's. 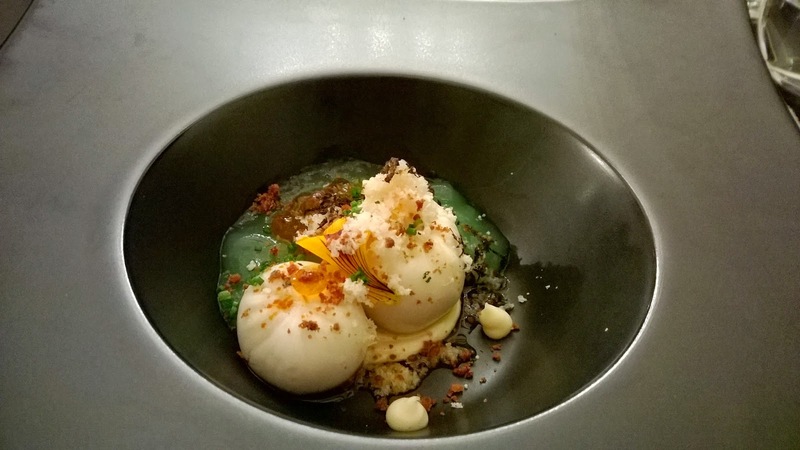 Why cultural - think of it as a coming together of Portugal and South Africa on a plate. And on the wall, considering the art. I overheard a colleague chirp that Nando's was nothing but glorified fast food. An injustice. He obviously has not tried it! Me, I am already planning my next visit.